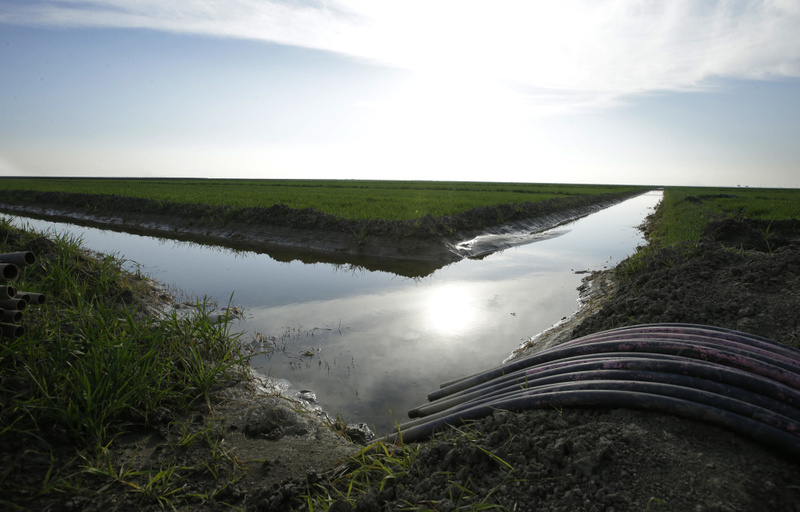 In this Feb. 25, 2016, file photo, water flows through an irrigation canal to crops near Lemoore, Calif. The Trump administration says it chose "not to move forward" with a massive California water project. The Trump administration distanced itself Wednesday from Gov. Jerry Brown's ambitious plan to build California's biggest water project in decades, casting the $16 billion proposal to build two giant tunnels as another legacy from the Obama era that it does not support. The comments from a U.S. Department of the Interior spokesman marked the first public statements by the Trump administration on the initiative and signaled the latest setback for the project that California's 79-year-old leader had hoped to see launched before he leaves office next year. The Obama administration gave millions of dollars for planning the tunnels, but "the Trump administration did not fund the project and chose to not move forward with it," Russell Newell, deputy communications director for the U.S. Interior Department, said in an email. Asked in an email exchange if his statement meant the Department of Interior "isn't going to be moving forward with California's tunnels project, is that right? The Trump administration has ruled that out?" Newell responded, "Yes." Newell later softened the statement, saying the Interior Department shared California's goals for a more reliable and environmentally friendly water supply but "does not expect to participate in the construction or funding" of the project in its current form. Interior officials "will continue to work with the state and stakeholders as the project is further developed," Newell said. Brown wants California water agencies to pay to plan and build two, 35-mile-long tunnels to divert part of the state's largest river, the Sacramento, to supply water to the San Francisco Bay Area and central and Southern California. But the plan has hit its biggest obstacles yet in recent weeks, when two key water districts opted not to help fund it. In another setback, the Interior Department's inspector-general last month challenged the $84 million that the federal agency had contributed to the project under Obama, calling it an improper use of taxpayer funds. As a presidential candidate, Donald Trump called broadly for more projects to bring water to farmers in California, the country's leading agricultural state. "The statement provided by the DOI confirms what the state and its water project partners already knew; while the federal government does not intend to fund the construction costs of the project they will continue working with the state and stakeholders to facilitate and permit WaterFix," she wrote in an email, using the state's term for the tunnel project. Trump's administration had not previously taken a stand on the tunnels project pushed by California's Democratic governor, though federal wildlife agencies gave the green light in June. They found that the plan would not mean extinction for endangered and threatened native species, including native salmon. Trump's policies also are at odds with many of those backed by Brown, who has referred to the president's supporters as cave-dwellers and called Trump's actions in office "stupid and dangerous and silly." Until now, however, Brown had avoided most public rifts with the Trump administration over federal decisions dealing with California. Brown's administration and the Metropolitan Water District of Southern California, with Brown one of the project's main backers, argued the two tunnels — each the width of a three-lane highway — would make for more reliable water supplies, especially for the more arid south. Supporters and opponents disagree on the effect on struggling native species. Opponents say the tunnels could be used to drain much of the water from the West Coast's largest estuary — the San Francisco Bay and adjoining rivers. "At a minimum, this announcement certainly complicates the state's chances of ever funding and permitting the massive twin tunnels project," said Doug Obegi, a senior attorney for the Natural Resources Defense Council, which opposes the plan. "It's yet another reason for the state to transparently work with all stakeholders to reconsider this proposal." Newell, with the Interior Department, made his statements in response to a request Tuesday by California's Democratic members of Congress for a new probe of U.S. spending on the project under Obama. "The $84 million spent in taxpayers' money without disclosure to Congress and kept hidden from the public were decisions driven and executed by the Obama administration and that team," Newell said. Interior Secretary Ryan Zinke "believes that using tax dollars wisely and ethically is a big responsibility and is at the heart of good government," Newell said. Federal and state authorities were discussing cooperation on the project since at least 2008, when George W. Bush was in office. Obama's administration pushed for the tunnels, including funding planning costs.